Composing is a deeply nourishing experience, playing with endless sounds, textures and color, evoking emotional landscapes of great diversity, excitement, drama and passion, that is when I feel so grateful for this language that transports and brings a level of transcendence to all. Australian composer Amanda Lee Falkenberg established a relationship with music at the young age of two-and-a-half when she first began playing songs on the piano that she heard from the music of live marching bands and then transcribed them at the piano. From then on, she dedicated the next two decades perfecting her craft, winning numerous awards for her piano playing and was accepted into the performance degree at the Conservatorium of Music, South Australia. After graduating with a full scholarship in Honours Piano Performance, she won a position as pianist with the prestigious Australian Ballet Company. This vibrant environment of blending movement with music is where she began to cultivate her creativity as a composer. Her gift for crafting music to accompany ballet dancers as they trained, progressed to her recording over 120 captivating compositions for her highly acclaimed Moving With Music 3-part CD series. This led to a fortuitous commission to write a 30-minute orchestral ballet that premiered at the Barossa International Music Festival with Leigh Warren and Dancers, full orchestra, conductor Antony Walker and Falkenberg herself at the piano - the perfomance received glowing reviews in the national press. Natural progression led her to the art of scoring music to motion picture, and she has since then written for short films, feature films, theatre, documentaries and TV animation series. Her original solo piano soundtrack to the silent short film Marie was also premiered at the short film corner at the Cannes Film Festival. Recent achievements of 2016 includes her orchestral score Mermaids Maiden Voyage winning in the Instrumental category at the Great American Song Contest where more than 1800 songwriters from 44 countries competed. The following month her music score for an animated short film contest became a finalist at the Marvin Hamlish New York film music competition where her music was selected as one of 10 finalists in a field of over 300 International entrants. Earlier this year, she decided to enter the newly commissioned work The Lodore Falls of Borrowdale for piano trio into an international composers contest in Italy devoted to the music of Maurice Ravel, in which the score managed to reach the finals and was awarded 'The best composers of the world', the piece obtaining a 'special mention' from the jury. The composition The Lodore Falls of Borrowdale will also receive its world premiere at Saint Cyprian's Church in London on 15 November 2016 played by members of the Lodore Trio. 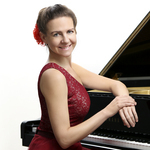 With numerous awards from the Hollywood Music in Media Awards (HMMA) and Los Angeles Music Awards for her soundtracks have received over recent years, Falkenberg continues to devote her time between advancing her film composing skills while also educating talented pianists and composers from her current base in Dubai, United Arab Emirates.